IBM Notes e-Discovery, email Search & email Compliance Software - What Is ReduceMail Pro Audit? What Is ReduceMail Pro Audit? ReduceMail Pro Audit is a IBM Notes mail search utility that allows the IBM Notes Administrator to conduct real-time searches of server-based IBM Notes mail files and corresponding server-based archives (ReduceMail Pro archives or Lotus Domino archives). ReduceMail Pro Audit helps automate the location of pertinent content to support responses to subpoenas, FOIA requests, and internal audits and investigations. Search results can be removed, copied to an audit database, or moved to a specific mailfolder for later review. complete enterprise-wide search of IBM Notes mailfiles, server-based Lotus Domino archives and primary ReduceMail Pro archives. control over the audit process. assistance with responding to legal document search requests such as FOIAs, subpoenas, and legal discovery. statistical sampling of email for supervisory purpose. legal hold as an option. Consolidation is an optional feature that is available with Audit for an additional charge. ReduceMail Pro Audit will perform enterprise-wide date-limited IBM Notes keyword searches, as well as IBM Notes searches on sender, receiver, subject lines and attachment names. The identified emails can be copied over into a Search Results database with the original date marked, moved to folders within the individual IBM Notes mailfiles or be destroyed. This can help you respond to subpoenas and other discovery requests. ReduceMail Pro Audit also allows you to track which IBM Notes mailfiles may have IBM Notes archiving set up and the location of the archives. ReduceMail Pro Audit searches server-based mailfiles, Lotus Domino archives and ReduceMail Pro archives. ReduceMail Pro Audit allows you to choose the search parameters by permitting search according to IBM Notes organization, IBM Notes organizational unit, IBM Notes group, individual name, document age, subject line and/or attachment name and type. It also allows you to exclude any IBM Notes organization, IBM Notes organizational unit, or IBM Notes group for maximum flexibility. ReduceMail Pro Audit allows you to quickly respond to document search requests from your legal department. You enter the search parameters into ReduceMail Pro Audit and set it to work! ReduceMail Pro Audit helps you locate unwanted mail such as .mp3 files, .jpg files, and .exe files. You can then dispose of them accordingly to help control diskspace and maintain the health of your mail servers. ReduceMail Pro Audit also allows you to recall emails with incorrect or damaging content. For example, if an employee sends out an email to the whole organization with the incorrect list of annual holidays, you can recall the email using ReduceMail Pro Audit. ReduceMail Pro Audit has an optional feature that allows you to consolidate backup replica databases. The consolidated databases will have all of the documents included in the backup databases without duplication. ReduceMail Pro Audit helps you help the compliance department monitor a sample of emails through a simple IBM Notes search & retreive process. Just search the system for particular content and enter the sampling rate and ReduceMail Pro Audit produces a random sample for review. ReduceMail Pro Audit allows you, as an additional option, to put multiple legal holds on mail documents and remove them individually. The legal hold will prevent the documents from being processed by any ReduceMail Pro product and will also prevent the end user from deleting or changing the documents. What is ReduceMail Pro Audit ? ReduceMail Pro Audit allows you to respond to subpoenas and FOIAs by real-time searching of IBM Notes mail files and server based Lotus Domino and ReduceMail Pro archive files - it is the system your lawyers will love. 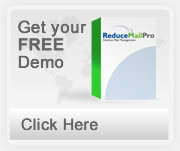 Is ReduceMail Pro Audit easy to use? Yes. Our developers have made every effort to make ReduceMail Pro Audit simple and user-friendly in every way, from the basic user interface to the selection of features. We know your time is valuable and we treat it as such. Is ReduceMail Pro Audit useful for FOIAs and subpoenas? Yes, it was constructed with those purposes in mind. It can find the appropriate documents and then copy them over into an IBM Notes database that you can send to the legal department. Is ReduceMail Pro Audit useful for mandated mail supervision? Yes, it can retrieve a specified percentage of memos sent out from particular IBM Notes groups or IBM Notes organizations. You can then set up a workflow system to make sure those memos are audited. Can ReduceMail Pro Audit search archive files as well? Yes, if they are server-based and enabled Lotus Domino archives or server based ReduceMail Pro archives. Can ReduceMail Pro Audit find just certain types of files, for example, *.exe files? Yes. Can ReduceMail Pro Audit find files based on a full text search? Yes. Can ReduceMail Pro Audit recall memos based on the subject line? Yes. Does ReduceMail Pro Audit use the real-time Name & Address Book? Yes. As soon as you change the person or group documents in the Name & Address Book they are available for use by ReduceMail Pro. Does ReduceMail Pro Audit run on AS/400, AIX, UNIX or Linux platforms? Yes - it is compatible with ALL platforms. Is ReduceMail Pro Audit compatible with IBM Notes R9? Yes. The current version runs on IBM Notes R6-R9 and automatically adjusts its processing to the IBM Notes version. Is ReduceMail Pro Audit compatible with clustering? Yes. Can ReduceMail Pro Audit remove just certain types of files, for example, *.exe files? Yes. What if ReduceMail Pro Audit times out? It will continue next time where it left off until it is finished. Can I make sure that ReduceMail Pro Audit does not affect the documents of selected users such as executives? Yes. Just specify an IBM Notes group with those users and tell ReduceMail Pro Audit you want them excluded from the removals. Does ReduceMail Pro Audit remove mail before it reaches users' IBM Notes mail databases? No. It only removes mail already present in users' mail databases. Where do I find the instructions for installing ReduceMail Pro Audit? The instructions for installing ReduceMail Pro Audit are in the Help - Using This Database document that comes with the system. In addition to Processing Reports, ReduceMail Pro Audit also generates Individual Processing Reports. They include the granularized information. ReduceMail Pro Audit is designed for a multi-server Lotus Domino environment. It uses LotusScript based agents and runs on all Lotus Domino platforms. It works with IBM Notes versions R6-R9 and will be compatible with future Lotus Domino software one month after gold releases. ReduceMail Pro Audit is platform independent and has been tested on Windows, Solaris, Linux, Unix and AS/400 servers. Below are some examples of how ReduceMail Pro Audit might save your organization time and money. Some of these examples might affect the organization itself and some might affect the IBM Notes administration. Here is a possible scenarios for 10,000 users. Lower cost of production of email evidence in a lawsuit. The costs of producing email evidence in the event of a lawsuit are astronomical. Typical numbers quoted are $1 per memo. A staff person who keeps all mail can cost thousands of dollars if he or she is targeted in the discovery process. ReduceMail Pro Audit allows you limit your IBM Notes searches until you get the exact data sample you need, minimizing the number of extraneous emails. If your identification of the mail is 20% more efficient, you can save $20,000 by limiting a IBM Notes discovery to 80,000 instead of 100,000 documents.